You cannot imagine a site, which doesn’t provide a chance to leave your message. 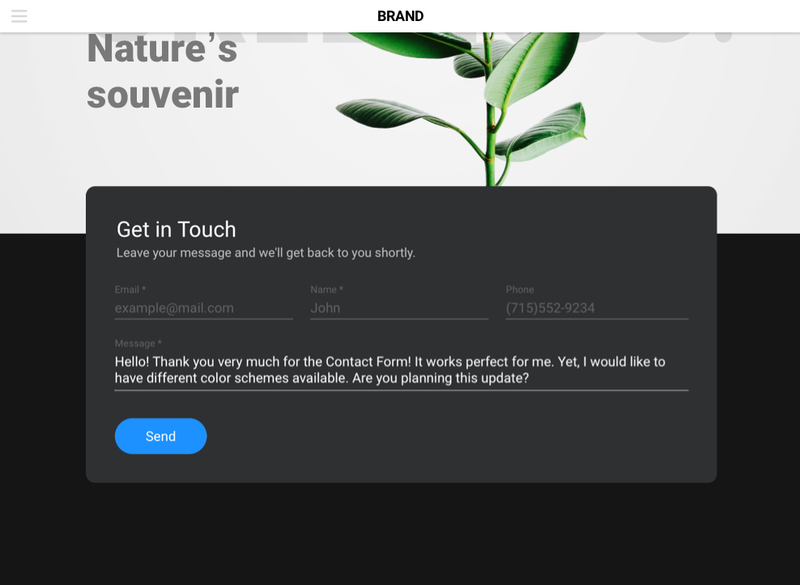 Multiple response forms, message or reply forms and other tools helping stay in touch with visitors are crucial. Create any of that yourself without coding skills needed! BONUS: Generate Contact Form right now! 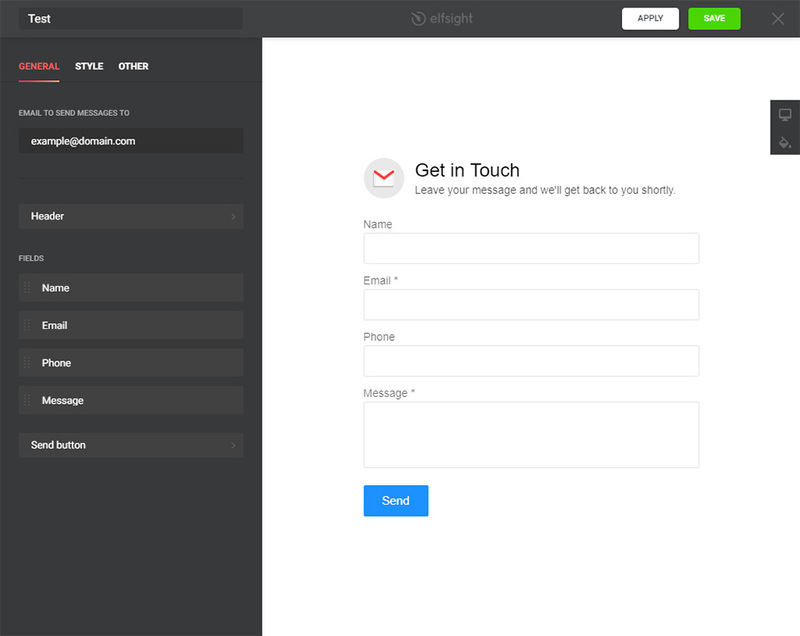 Elfsight Apps Contact Form is an easy and totally adjustable widget allowing to create any option of contact form. If you are searching for a user-friendly tool, which will boost visitor responses and raise your conversion rate – this widget is right for you! Learn more about the widget. Stay in touch with customers 24/7, receiving messages on preferred email and boost leads for your business! Installation of our widget is extremely easy and intuitive; it will take only a couple minutes. Follow all steps stated below to shape a widget. Follow this link (Live Editor) to create a plugin. Choose the layout and display parameters to create the plugin that will be most appropriate for your site. Or learn more on product page. After your plugin is developed, pick out your subscription plan. We have free and payable plans to suit any needs. The final action in installing our plugin is to add the plugin script. Display your form at one of the pages or add a popup form to each and all pages of your website. 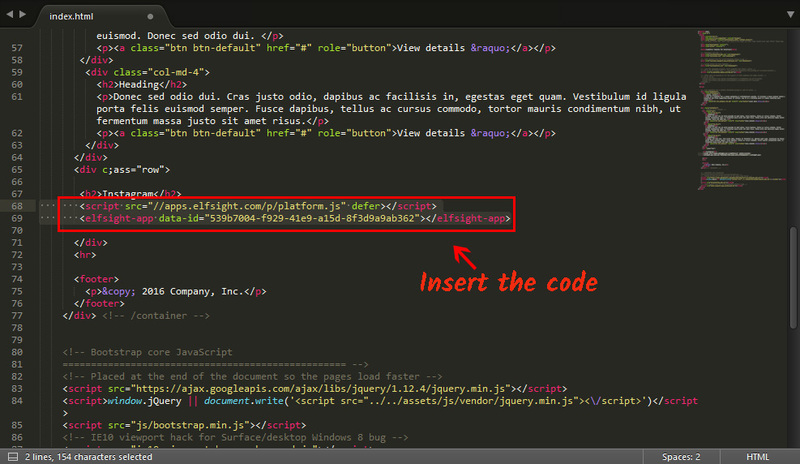 Open the template file in the editor and add plugin code to the required unit. Save the changes and refresh the page. Plugin installation to HTML site is finished! After you have updated the template on the server, enter your site to check the plugin. After the product is shaped, you can as well customize it any way you need. For this, go to Elfsight apps site and enter Live Editor. You can edit texts, alter templates, or choose the suitable display option. The changes you’ve made in the Live Editor will made on your site right away. For trying and installing other powerful HTML widgets by Elfsight team, visit your Elfsight account. 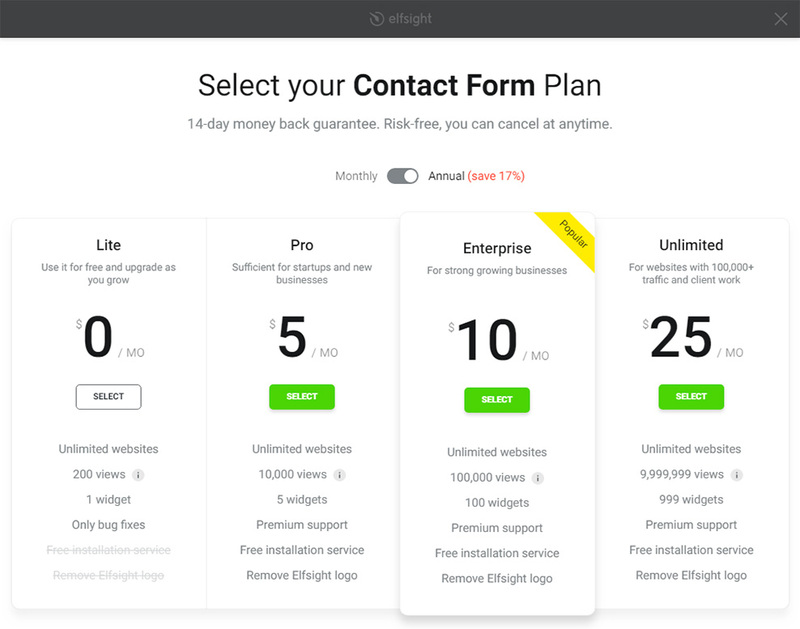 Generate a customized Contact Form right now! Free editor for fastest widgets shaping.